Raised in Kentucky and Southern California, Donavon Lerman was not born into the culture of Arabic percussion, but he has nonetheless made it his avocation, approaching it with dedication, passion and a mission to spread its power to American audiences. His first teacher, Rico Orel, afforded him an introduction to the dumbek (also called the darbuka). Shaped like an hourglass, it rests in the drummer's lap. It is customarily made of ceramic, its head fashioned from goatskin. 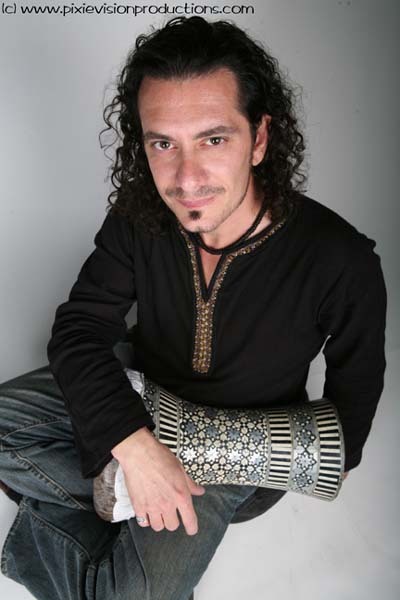 Donavon next sought out renowned Lebanese percussionist Souhail Kaspar. The exacting, conservatory-trained Kaspar taught him terms and techniques, building upon his foundation in the instrument. The student also learned from the teacher outside the classroom, serving as his business assistant. After five years with Kaspar, Donavon took a class with Syrian Faisal Zedan, who eventually adopted the role of coach. Donavon started to meet with him weekly, taking up more-intricate styles of play. Zedan taught him how to put what he'd learned into practice," Donavon explains, "how to make words, sentences and poetry, and how musical ideas and phrases become complete." Donavon later decided to form an ensemble that would familiarize people with the dumbek and Arabic percussion in general, a group that would perform at parties, festivals and even in people's homes. He invited Zedan to join him in this endeavor. The new ensemble was called Youm it Talaata - Arabic for "Tuesday," the day Donavon received his weekly instruction from Zedan. As he developed his skills, Donavon also began working with dancers. He says the interaction is reminiscent of the Indian form in which every note of the drum is matched by a movement of the dancer. He enjoys demonstrating how this works, exploring the connections among the music, the dancer and the audience. In addition to sharing his love of the drum with audiences, Donavon has developed an interest in ethnomusicology, amassing an archive devoted to contemporary dobbat iqaa - officers of rhythm, the Arabic term for percussionists. He compiles information about the prominent players in the genre, and videos of them playing, and posts them on the Internet. He and Zedan have traveled to Turkey together to research, interview and record drummers. He has also spent time in Egypt and Morocco and hopes to travel throughout the Arab world. Donavon is one of very few Americans in Southern California working in the Arabic style. He's also something of an oddity in that most of his colleagues have been immersed in the music all of their lives, whereas he did not come by it until he was nearly 30. Still, his commitment has never wavered. He says the discipline of Arabic percussion keeps him focused in all areas of his life and that he frequently attains a meditative state in the playing. "Sometimes I have these glimmers," he illuminates, "where I am completely inside the music. I know exactly where the next note will be and I play something instinctively that I couldn't play before. That's an incredible experience."